Archaeological Survey And The Mediterranean Countryside. Empty Spaces & Empty Phases: Research Questions, Scales And Methods. Department of Classics, University of Cambridge, UK, ROOM 1.04. 25 May 2016 (13:00) to at 26 May (14:00). Speakers and discussants – Graeme Barker, Cyprian Broodbank, Stefano Campana, Charley French, Evangelia Kiriatzi, Rowan McLaughlin, Martin Millett, Cecilia Moine, Chris Musson, Dominic Powlesland, Antonio Quiros, Simon Stoddart, Fank Vermeulen, Robert Witcher. • 2017 – Toulouse 18-21 September – Institut Supérieur de l’Aéronautique et de l’Espace. Introductory keynote speech: Drones in Archaeology. • 2017 – Chur, Switzerland, 22.23 June. Zum “digital turn” in der Schweizer Archäologie. Introductory keynote speech: Archaeology in the Age of Sensing: Digital Methods and Remote Sensing in Archaeology.2017 (planned) – Chur, Switzerland, 22.23 June. Zum “digital turn” in der Schweizer Archäologie. Introductory keynote speech: Archaeology in the Age of Sensing: Digital Methods and Remote Sensing in Archaeology. • 2016 – Ljubljana, 28th-29th October, Institute for the protection of cultural heritage of Slovenia, Center for preventive archaeology, workshop on (Re)thinking archaeological potential in preventive archaeology. Introductory keynote speech: TOWARDS MAPPING THE ARCHAEOLOGICAL CONTINUUM – New perspectives and current limitations in Planning Led Archaeology in Italy. • 2016 – University of Paris Sorbonne, JIAP conference, 7-10 June: Emptyscapes: Towards counternarratives of ‘EMPTY’ Mediterranean Landscapes? • 2016 – Belgian Academy at Rome, February 3rd-5th, 2nd International Conference of Aerial Archaeology: From Aerostats to Drones: Aerial Imagery in Archaeology. Opening talk: Expanding the Boundaries of Aerial Archaeology: from Balloons to Drones. • 2015 – Warsaw, Poland The Institute of Archaeology and Ethnology, Polish Academy of Sciences, the Polish Center of Mediterranean Archaeology, University of Warsaw, the Copernicus Science Centre, 11th International Conference on Archaeological Prospection, 15–19 September 2015. • 2015 – Institutum Archaeologicum Germanicum at Rome (18 June 2015): EmptyScapes. Filling Empty Mediterranean Landscapes, mapping the archaeological continuum in rural and urban contexts. 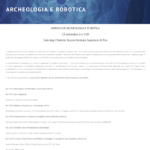 • 2015 – Computer Application and Quantitative Methods in Archaeology Eastern European Countries Joint Chapters (28-29 May 2015), conference opening talk: Archaeologists and technologies: a controversial connection. • 2015 – Central European University at Budapest, New Digital Technologies and Hungarian Innovations in Heritage Management – Archaeology, Historical Landscape and Built Heritage (6-7 February 2015), title of the talk: Mediterranean contexts and Total Archaeology. Why do we need it? • 2014 – University of Bucharest, (5 June 2014), Keynote presentation: UAV for archaeological purposes: an overview. • University of Modena & Reggio Emilia. 14th Conference of Environmental Archaeology 2018, 26-28 February, Human and environmental sustainability: Lessons from the past ecosystems of Europe and Northern Africa. Talk title: EMPTYSCAPES: Towards Filling Gaps in Mediterranean Landscape Archaeology. • British School at Rome, Tracce dalla Terra, workshop, November 8th: Emptyscapes. Filling ‘empty’ Mediterranean Landscape, Mapping the Archaeological continuum, Rusellae case study. • University of Cambridge, McDonald Institute for Archaeological Research, 18-19 May 2016, Ancient Topography, landscape archaeology and human landscape. Workshop on the different perspectives in the study of the ancient (urban) space: Some thoughts on current trends in the archaeology of urban contexts and rural landscapes in the Mediterranean world. • Royal Society of Edinburgh (University of York and Royal Commission on the Ancient and Historical Monuments of Scotland), Orkney 12-15 March 2016, Land marks. The future of integrated landscape research: Emptyscapes. Filling ‘empty’ Mediterranean Landscape, Mapping the Archaeological continuum. 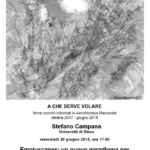 • 43rd CAA, KEEP THE REVOLUTION GOING 2015, University of Siena (Italy): LONG WALKS IN THE ITALIAN COUNTRYSIDE Large –scale geophysical prospection in rural and once -urban contexts in central Italy (with K. Saito and B. Frezza). • Georg August University-Göttingen and University of Palermo, Survey-Archäologie, Naturwissenschaftlich-technische versus historische Methode in Italien und Deutschland, 30 march-2 April 2015: EmptyScapes. Filling Empty Mediterranean Landscapes, mapping the archaeological continuum in rural and urban contexts. • University of Frankfurt, 24-26 February 2015, From Arcland to EmptyScapes: Filling ‘empty’ landscapes, mapping the archaeological continuum. • University of Cambridge (UK), 3rd February 2015, Seminar of the Faculty of Classics: EmptyScapes: Filling ‘empty’ landscapes, mapping the archaeological continuum. • University of Sassari, dept. of Humanities and dept. of Architecture, Design and Urban Planning organize the Workshop on Landscape Archaeology in Sardinia: “Point Line Surface. Confronting landscapes” Tresnuraghes (OR), 14 June 2014, talk title: Dalla Carta Archeologica della Toscana ad Emptyscapes: cosa cambia per la ricerca e la pianificazione del territorio? • Royal Netherlands Institute in Rome, 28th May 2014, Symposium Archaeology from the Sky: EmptyScapes: Filling ‘empty’ landscapes, mapping the archaeological continuum. • École Normale Supérieure – Paris. October 10 2016 “Drones in archaeology: State-of-the-Art and Perspectives”- ENS, Tout public. • École Normale Supérieure – Paris. October 16 2016 “The role of christianization in the transformation of the countryside from late antiquity to middle ages in Central Italy” – Séminaire sur l’Italie – AOROC. • École Normale Supérieure – Paris. October 24 2016 “EMPTYSCAPES PROJECT 1: backdrop, analysis and outcomes of Rusellae sample area” – Séminaire « Fragments » – AOROC. • École Normale Supérieure – Paris. December 6 2016 “EMPTYSCAPES PROJECT 2: backdrop, analysis and outcomes of Veio sample area” à l’EPHE. • University of Oxford (UK).18 June 2016. Aerial Archaeology in Europe and the Middle East: Past, Present and Future. Talk entitled: Approaches to Aerial Archaeology in Italy. • University of Siena (Italy). 22 March 2016. Seminar at the Department of History and Cultural Heritage. Talk entitled EmptyScapes: Filling ‘empty’ landscapes, mapping the archaeological continuum. • University of Cambridge (UK).10 November 2015. Seminar of the Faculty of Classics. Talk entitled on the activity and outcomes of the fieldwork campaign. • Institutum Archaeologicum Germanicum in Rome.15. 4. 18 June 2015. Talk entitled EmptyScapes. Filling Empty Mediterranean Landscapes: mapping the archaeological continuum in rural and urban contexts. 5. • University of Cambridge. 21 January 2015. Monitoring visit to the Chancellor, Masters and Scholars of the Old Schools, Trinity Lane, Fellows’ Individual reports, short project presentations. • University of Cambridge (UK).6. 3 February 2015. Seminar of the Faculty of Classics. Talk entitled EmptyScapes: Filling ‘empty’ landscapes, mapping the archaeological continuum. • University of Cambridge (UK).7. 16 December 2014. Talk at faculty seminar relating to on-going archaeological projects including EmptyScapes project.